Francisco Torán García from Castellón, Spain. The aim of the “Welpen sind keine Ware” (puppies are not goods) initiative is to put a stop to the practices of the European dog mafia.The advice of the initiative's partners: don't buy puppies on the Internet, on the market, from a car boot or from a pet shop. As every show, it all started small. In 1964 Mr José Misselyn organised the first edition in Menen, a small town near Courtrai. In 1970 I entered my Great Dane for this show and I remember that it already took place in the first expo halls of Courtrai. INCA’S DOG SHOW: The first event under this name was the Americas and the Caribbean Show which was held in Lima in 1994, and it then went on to become established as the most important show of the year on the international circuit, coinciding with the close of the annual calendar of the Peruvian Kennel Club’s shows. 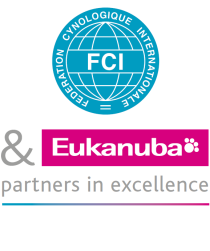 2013 Seoul FCI International Dog Show, one of the biggest show of the year, hosted by the Korea Kennel Federation was held at aT centre, Seoul, on 7-8 December. This show was organized in conjunction with AKU Championship Dog Show and KKF Championship Dog Show.